(Mis)Readings: Long Live "The Dead"
Every year, I read James Joyce’s “The Dead” on the first night of snowfall. I’m not Christian, so the sense of Christmas tradition never resonated for me, but the swirling motifs of snow and wind echo with each winter, the black-ink letterforms intertwined with the white and falling flakes I see outside my windows as I read. Last year, I came across John Huston’s film version of The Dead. I’d heard about it years before in the Wall Street Journal, which claimed that the film achieves the near-impossible: it “shows what [film] can do to enhance the enjoyment of a great literary work.” Since so much in Joyce's writing hinges on his perfect construction of sentences and phrases, I wanted to see how film would increase my appreciation. For the larger part of the story, Joyce’s prose hews closely to realism, and it was a simple pleasure to watch the characters enact the same words and motions on the screen, from pouring drinks to dancing with each other. As I watched at home, my brother the classical pianist-turned-keyboardist overheard Mary Jane’s piano performance, “full of runs and difficult passages,” and remarked that whoever was playing was unusually good. 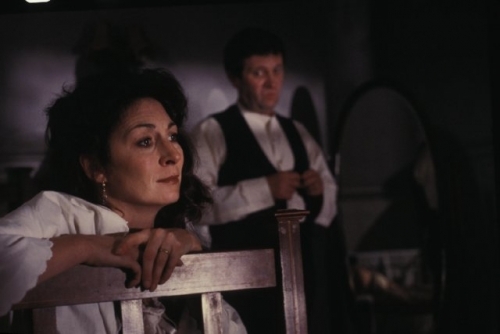 The whole thing seemed to be a perfectly executed and emotionally fulfilling period drama, carefully steeped in political discussions and subtle allusions to Irish cities and struggles. So she had had that romance in her life: a man had died for her sake. It hardly pained him now to think how poor a part he, her husband, had played in her life ... He had never felt like that himself towards any woman, but he knew that such a feeling must be love. Constantly I hear reports from the front lines of newspapers and blogs that the novel is ailing, is dying, is dead. But moments like this convince me otherwise, when I am able to so fully enter another person’s consciousness that, unlike with theater or film or any other form of art, I am able to forget myself and imagine another world. I wanted to write about how I could (mis)read James Joyce’s “The Dead” through John Huston’s The Dead. But when the short story’s eye moves gently and surely from Gabriel’s actions to his thoughts to his pure emotions, it’s a joy to read. As I came to the end, hearing those same wordsflattened to a voice-over monologue, even when set against the natural beauty of Ireland in snow, stripped the epiphany of its power to completely immerse and change the reader. Whereas the movie indeed enhanced my enjoyment of the story on the whole, the last five minutes pulled me back to the words on the page, not on the screen. The movie is a masterpiece in its execution, but the novella by virtue of its form surpassed its cinematic imitation. I was a passive viewer, but I decided to become an active reader again. I turned back to the book in my hand, and admired the way my sensations interlaced with Gabriel's own: "His soul swooned slowly as he heard the snow falling faintly through the universe and faintly falling, like the descent of their last end, upon all the living and the dead."